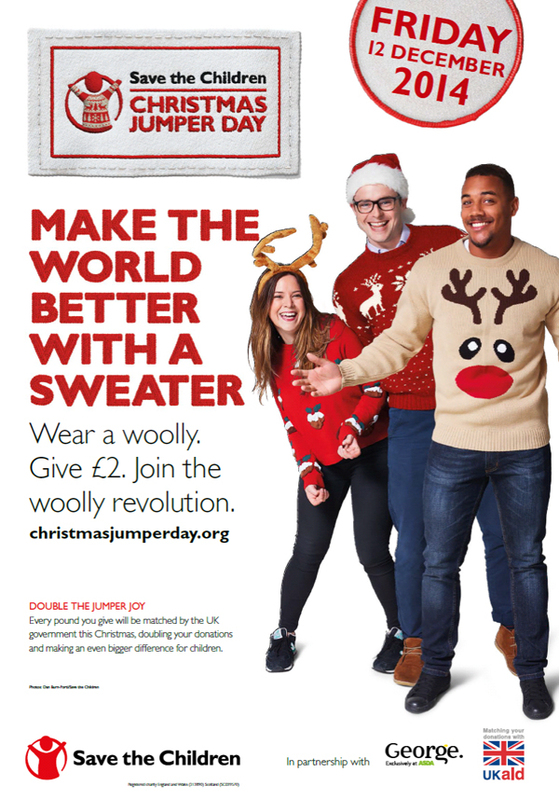 Text ‘TeamKangaroo’ to 70050 and donate £2 to wear your jumper. No jumper – no worries!! Just decorate an old jumper, wear a t-shirt, or just a Christmas hat! Come on join in the fun!! Specialist Fabrication spec guide is released! Are you looking for a bespoke architectural metalwork solution that adds that extra special finishing touch to your design? 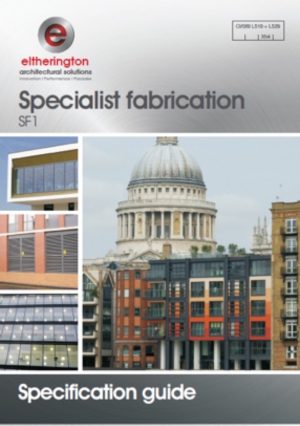 If so then you’ll find our new specification guide for Specialist Fabrication an essential addition to your knowledge base – and one of the best ways of making your buildings distinctly different. Packed with photographs, range overviews, design options and a comprehensive list of materials and finishes, it provides you with all the information you will need. The new specification guide comes with Eltherington’s 50-plus years’ experience of manufacturing bespoke metalwork solutions for the architectural sector. During that time we have supplied many of the UK’s most iconic buildings including Corpus Christ College in Cambridge, Edinburgh International Conference Centre and London Underground. The full suite of specification guides are available to download from our website or via the NBS page. Alternatively, you can request a printed copy from our customer service team. Throughout the year we have been adding to our suite of specification guides to make it easier for you to create a facade that encapsulates both the outward and inward personality of your design. Our aim is simply - to help you create inspirational structures that appeal to both the client and building users, whilst adding to the diversity of our built environment. As a result we are pleased to announce the availability of our Perforated, Roofline and Internal Cladding specification guides. 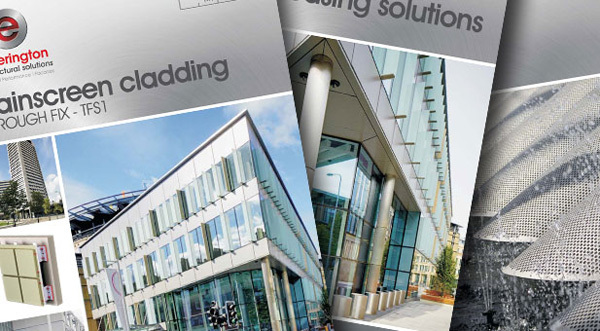 Offering a suite of specification guides covering all elements of a building envelope as well as internal areas, reinforces our 50 year heritage of offering specifiers a one-stop-shop for high quality architectural metalwork solutions. Alternatively, you can contact our customer service team to request a hard copy version of the specification guides. Please contact our customer services on 01482 320336 or email enquiries@eltherington.co.uk to reserve your print copy of any of our specification guides. 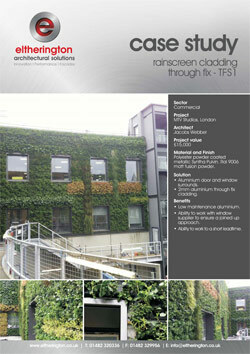 A wide range of Eltherington architectural facade solutions is now live on NBS Plus. The Eltherington NBS Plus portal gives specifiers access to the company’s rainscreen cladding solutions (Through Fix and Secret Fix), listed at www.riba-insight.com. More Eltherington architectural solutions are being added to NBS Plus all the time – which means there is always something new for visitors. Along with a copy of the specification guide for each solution, available to download, NBS Plus provides all technical information and drawings required to specify these high performance architectural solutions. In addition to an overview of each product solution, the NBS Plus profile showcases the full range of material and finish options available from Eltherington’s rainscreen cladding solutions. These include: aluminium, stainless steel, Rimex, Corten Steel, plus Reynobond and Reynolux, amongst others. The NBS Plus library provides access to over 20,000 product specifications from more than 600 construction manufacturers. It has therefore established itself as the ‘go-to’ tool for specifiers and building designers. “We’re keen to work alongside specifiers so we are continually adding product solutions onto NBS Plus, making it quicker and easier to specify high performance building facades,” said Antony Eltherington, Managing Director of Eltherington. 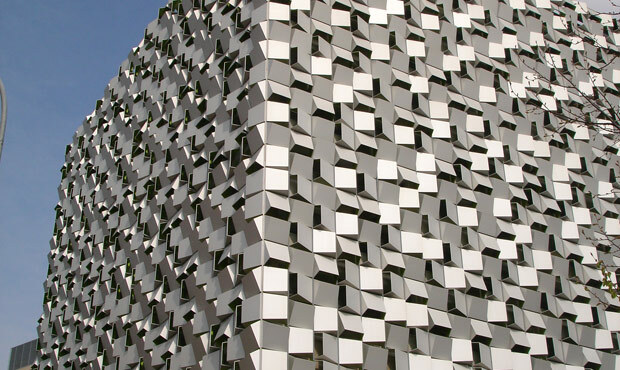 To find out more about our rainscreen cladding solutions, click here. A student residential development in Kings Cross, London, is benefitting from more natural light, thanks to our perforated aluminium rainscreen cladding window panels. Eltherington’s skills were called upon by Kings Cross’ architects, Mansells, to provide the buildings with perforated aluminium window cover panels, slotted panels, cill sections, extrusions and cladding. As well as optimising natural light inside the building, retaining a 40 percent open area across the perforated panels ensures continual flow of air flow into the ventilated cavities, expelling stale, moist air and reducing condensation in the process. To download our new Specification Guide for Perforated panels, click here or to order a copy call our customer services on: 01482 320336. A prestigious office block on Whitehall Road, Leeds, has created a suitably inspiring image for visitors thanks to stainless steel column casings from Eltherington. The office development, adjacent to Leeds Railway Station, has benefitted from our full, semi circular and three-quarter column casings. We supplied them with a supa-mirror finish, as specified, to give the entrance area a distinctive design aesthetic. Creating a uniform mirror finish required the use of our specialist in-house tooling capabilities. We are one of the few companies in the UK to offer this service. The 316 grade stainless steel column casings were fixed to the concrete structure using a secret fix system, including galvanised steel and aluminium helping hand brackets. Utilising a secret fix system retained the visual purity of the sup-mirrored finish material. Part of Eltherington’s remit also involved manufacturing an internal and external entrance feature door surround. Our experience of working on similar prestigious projects immediately gave the client confidence that we would deliver what we promise. Aside from a number of different mirrored finishes, Eltherington offers a wide range of different materials and finishes. Redcar Leisure Community Heart has made the grand opening impression it was looking for, thanks to our perforated mesh solar shading. The solar shading was used across the facade to enhance its architectural aesthetic and provide the building with energy performance benefits. 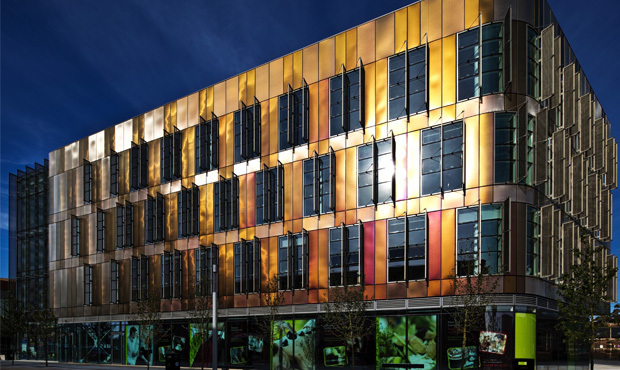 Eltherington manufactured and supplied purpose made frames and solar shading units in anodised Anolok 545 medium bronze and Anolok 541 light bronze to create a modern, aesthetically pleasing facade on this £31m development. The aluminium solar shading system is tough and hardwearing, which was essential to the project’s architects and owners as the building is in a coastal location, exposed to the North Sea. 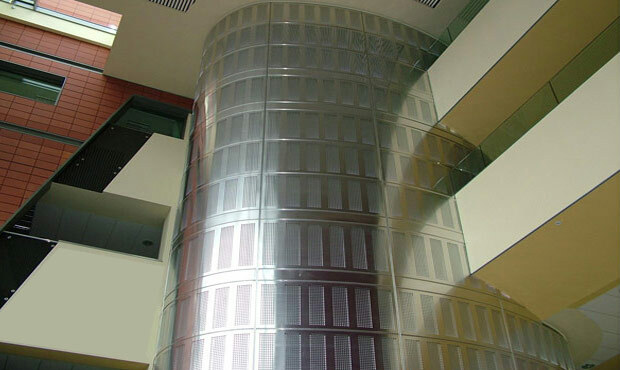 The perforated mesh panels’ ability to reduce solar gain minimises reliance on energy intensive mechanical cooling systems during the summer months. Michael Riding, Director at Eltherington, said: “Our perforated mesh panels are available in a wide range of materials and finishes, which was important on this project as the designers were looking for a bespoke solution that complimented other elements of the facade. The solar shading adds another architectural dimension as well as providing energy saving benefits. Redcar Leisure Community Heart incorporates an all-weather sports and leisure centre, swimming pools, business centre and multi-functional meeting and community spaces for Redcar residents and visitors to the town. For more information on our perforated solutions, or for a copy of the new Specification Guide – Click here. A contemporary office building in Hull has achieved its goal of becoming an environmentally-friendly, low carbon building, thanks to our perforated aluminium curved roof panels. Eltherington’s skills were called upon by The Arc’s designers, Niall McLaughlin Architects, to provide the coastal building with curved roof panels. 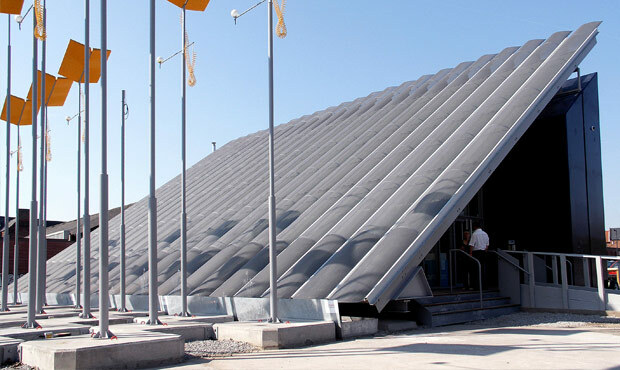 Our perforated aluminium solar shading panels were manufactured to allow maximum light into the building, reducing the need for electric lighting, and also to reduce the reliance on mechanical cooling systems during the summer months. The project’s architects carefully selected our marine grade materials due to their ability to withstand extreme weather conditions, similar to the challenging coastal conditions which this building would be subjected to. Eltherington’s perforated panels do not support combustion and can meet the requirements laid out in BS475 Part 7 Class O non combustible BS EN 13501-1. 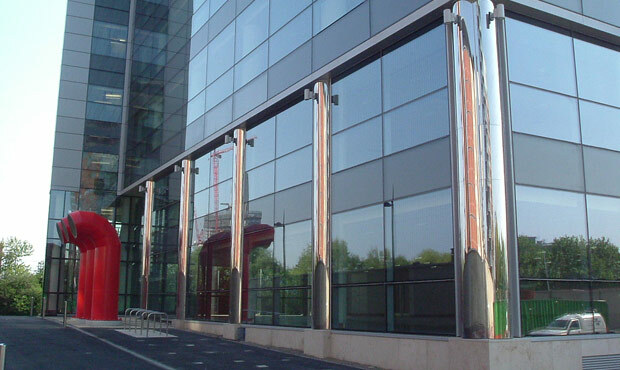 This contract was completed in 2005 and remains fully functional, as well as looking great- proof that the perforated marine grade aluminium was the correct choice! To download our new Specification Guide – Perforated, click here, or to order a copy call our customer services on: 01482 320336. Eltherington, along with its partners, has helped Sunderland Train Station meet regulations, and become a more aesthetically pleasing area, by installing column casings to the underground station. Even after 5 years of use it still looks amazing! 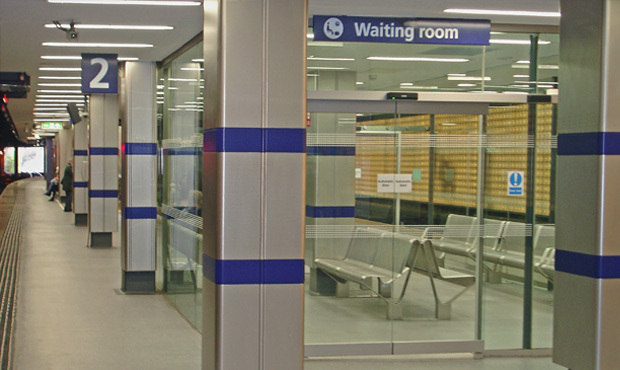 We supplied the station with pilasters and column casings from high quality 316 grade stainless steel Rimex. The items act as covers to hide unsightly cables and existing beams. As already mentioned the column casings we supplied were manufactured from tough, hardwearing stainless steel Rimex, the patter was 5WL and this has anti vandal characteristics. Working closely with the contractors, and with Rimex, we were able to complete the project in a short schedule, whilst minimising the disruption to passengers, and also meeting fire and DDA regulations with an impressive painted blue band. A series of large, interlinked developments in Sheffield has secured a position as one of the most design-inspired areas of the city thanks in part to specialist metalwork fabrications from Eltherington. We supplied products on the St Pauls project with Satin natural silver anodised aluminium solar shading / brise soliel, and cladding panels, which covered many areas of the building, including corners and ends. As we have the capability to offer a complete bespoke manufacturing service, we were able to work within the strict tolerances set by the architects on this ambitious design. Our extensive experience also allowed us to input a high level of design knowledge on and around the welded areas, ensuring that the bris soleil solar shading, and the cladding panels, complimented the overall contemporary design of the surrounding area. Viacom studios are living-proof of Eltherington’s abilities! With its ‘living’ walls, the new headquarters of the Viacom studios in London has become an eye-catching new addition to the capital’s cityscape. Eltherington supplied the building, which is home to a number of media companies including MTV, Nickelodeon and Comedy Central, with door and window surrounds in Polyester Powder Coated (PPC) aluminium. 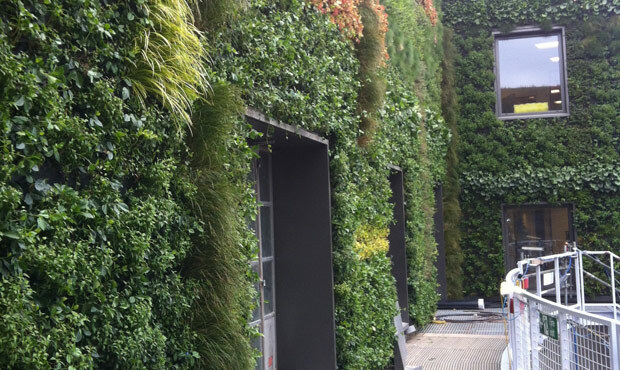 The building was designed to include a ‘living wall’ because of its sustainable credentials, along with a number of other benefits. Aluminium, being 100% recyclable, low maintenance and aesthetically pleasing also meant that our window reveals met the same, strict, environmental credentials. Eltherington has helped the RIBA Commended, BREEAM Excellent, Corby Campus at Tresham College in Kettering create a striking first impression with visitors, thanks to our internal cladding. We supplied the College with curved, perforated aluminium cladding for the lift shaft and surrounding walls, along with stainless steel wall brackets. 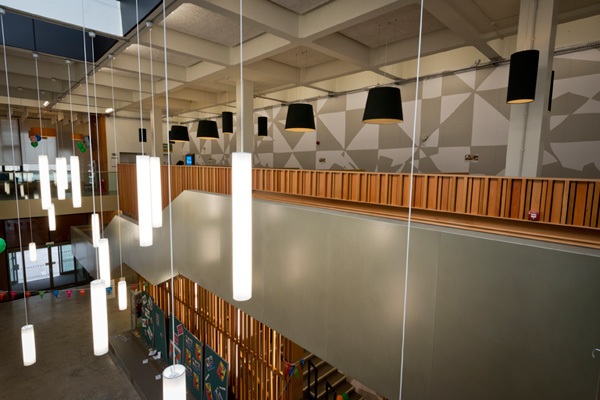 The perforated cladding supplied by Eltherington and specified by Bond Bryan Architects gives the main lobby a modern aesthetic, creating exactly the right impression with visitors for this forward-thinking college. Eltherington perforated panels do not support combustion and can meet the requirements laid out in BS476 Part 7 Class O non combustible BS EN 13501-1. To download our new Specification Guide - Perforated Panels, click here, or to order a printed copy, call our customer services on: 01482 320336. We are a one-stop shop for Tesco! Architects designing the new Tesco superstore in Coventry had to look no further for inspiration than our internal cladding and column casings. 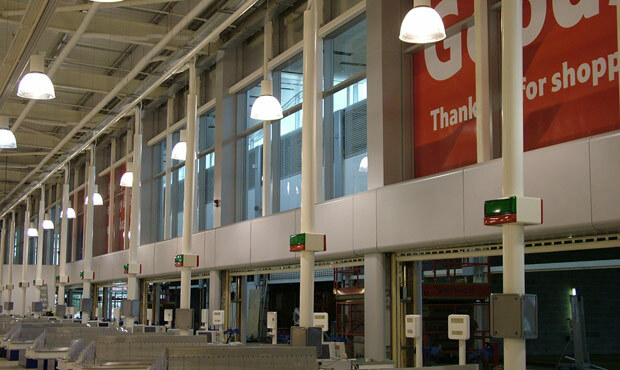 The product solutions for the superstore were manufactured at our state-of-the art facility in Hull, East Yorkshire, and include both pilaster and walkway column casings, bulkhead panels and cladding panels. Aluminium was specified for these elements because it is 100% recyclable as well as creating a modern, appealing aesthetic. Our full range of specification guides are coming soon! You may remember that last month we unveiled new specification guides for Rainscreen Cladding: Secret Fix and Through Fix. We’re now about to add to this with specification guides for Spandrel panels and Column casings, which will mean you’ll have even more information to hand when specifying these critical building elements. The specification guides can be downloaded from our website at www.eltherington.co.uk, offering you instant access, or you can contact our customer services for a printed version. Here at Eltherington we’ve committed ourselves to developing specification guides for all our architectural solutions – watch this space for further updates! Aimed at providing architects and specifiers with all the information they need to make designing buildings easier, our specification guides feature detailed installation drawings, support systems, along with material and finish choices. Please contact our customer services on 01482 320336 or email enquiries@eltherington.co.uk to reserve your copy. Looking for ideas on your next project! We now have a full selection of case studies available for download on our website. Listed by Sector and Solution, it allows you to find inspirational ideas for your next project within just a few clicks. Being available in PDF format means that you can easily print them off. Calling all architects! Our highly anticipated Metal Showcase is about to be unveiled. 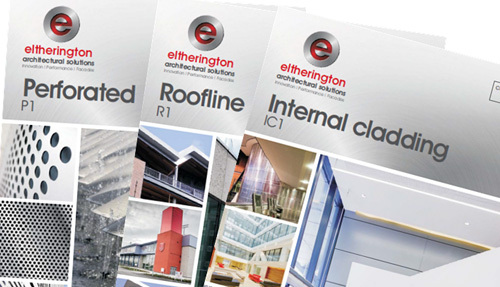 Packed with inspirational buildings that have benefitted from an Eltherington architectural solution, the 22 page brochure is guaranteed to become an essential reference guide. We wish Team Frillo all the very best on their 440 mile cycle from London to Edinburgh. Eltherington director Michael Riding is one of the 15 member team that is taking part and said “Why did I sign up ?...lol”. 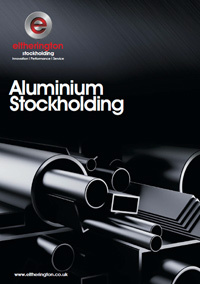 Our new aluminium Stockholding brochure is on its way! We are close to unveiling our brand new stockholding brochure, which means that both our literature and website will soon be fully up to date. The new Aluminium Stockholding brochure includes our entire range in an easy-to-follow, at a glance layout. The easy reference manual will include product codes, sizes and diagrams of the item to make it even easier to find the product you are looking for. The brochure will also include information on our delivery options, including same day or next day as well as our cutting and fabrication service. Email us to be the first to receive our aluminium stockholding brochure – coming soon! 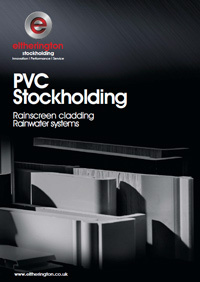 We are in the process of creating a new PVCu stockholding brochure that will be available in the next few weeks. Including our range of cladding, along with rainwater systems, it will provide you with an easy to use point of reference for a wide range of PVCu solutions. Need cutting or fabrication services? Don’t forget that in addition to our extensive range of stock we can also offer you a high quality cutting and fabrication service that uses the latest production equipment! With ongoing investment in latest technology, such as the advanced MIG/TIG, we can provide a wide range of services including bonding, sawing and decoiling. Our cutting and fabrication team is made up of highly skilled professionals who have extensive experience in all aspects of this specialised area. PS. Our Sales Counter on Dansom Lane South is now open from 7am – 6pm, Monday – Thursday and until 5pm on Fridays. 100 years of great service! 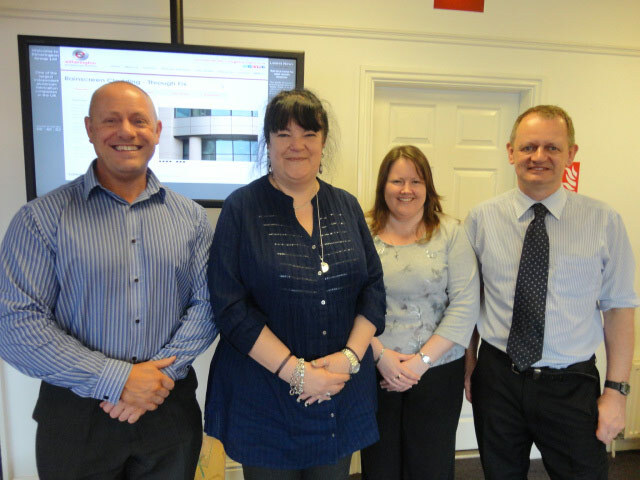 The combined experience of our stockholding team is close to 100 years! That kind of knowledge takes some beating! In fact, the stockholding team are confident that they will be able to provide customers with timely, accurate advice and guidance every time when it comes to sourcing stockholding components. And, with over 4000 high quality aluminium and PVCu products always in stock at Eltherington, customers are sure to find what they need. Eltherington is on to a winner! 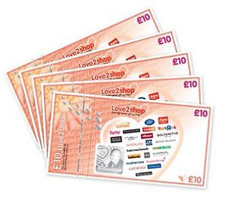 We have recently launched a competition on Facebook to win £50 worth of Love 2 Shop vouchers! Love 2 Shop vouchers can be used in most high street stores and even tourist attractions such as Alton Towers and Thorpe Park! All you have to do to be in with a chance of winning this fantastic prize is ‘like’ our Facebook page and answer a simple question. Competition ends 13th June 2014. Terms and conditions apply. Click here to enter. P.S. Don’t forget to like our second Facebook – Eltherington Group! 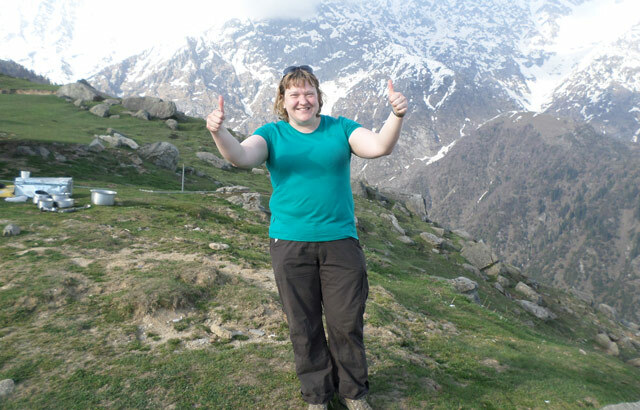 We would like to congratulate Jill Maundrill on completing the Himalayas Trek and raising with the team £110k for Dove House Hospice, Hull. Jill works for one of our largest clients to whom we sell leisure products such as aluminium cladding, roofs and windows. We have know Jill and her family for many years, Well done! Eltherington, one of the UK’s leading suppliers of high quality architectural, leisure and stockholding solutions, has hired 21 new staff over the last few months, following continued business success. The additional staff are required to meet existing demand at its 6-acre Dansom Lane South manufacturing site as well as forming part of an investment programme aimed at achieving growth targets set for 2014-2016. Filling a variety of roles throughout the business, the new staff, which includes a number of apprentices, will allow Eltherington to build on its reputation as a customer focused manufacturing business that delivers a high level of service. As part of its 2016 growth plans, Eltherington has also launched an advanced new website and branding that reflect its core values of innovation, performance and vision. Eltherington’s planned business growth will allow the company to continue to create a number of new jobs over the next few months, again boosting the local economy. 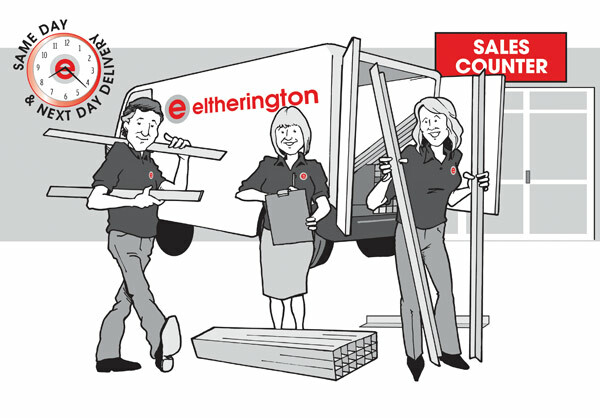 Eltherington manufactures high quality products for the architectural, modular building and leisure home sectors. The company has supplied a wide variety of prestigious projects including rainscreen cladding for the RIBA award-winning London Southbank University and perforated solar shading for Corpus Christi College at the University of Cambridge. 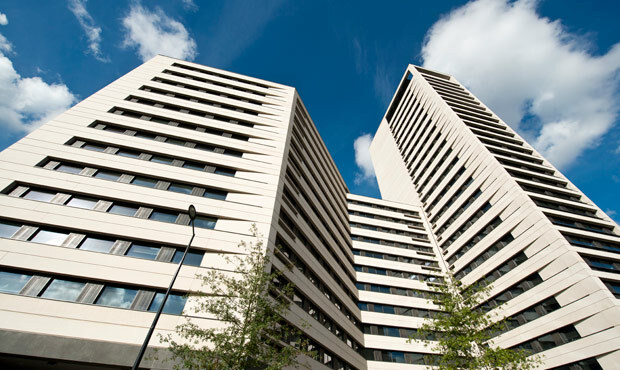 Alongside this, Eltherington has supplied high quality rainscreen cladding for both the LBBW Bank, Moscow and, closer to home, Bridgewater Place in Leeds, Yorkshire’s tallest building. Southbank University is better by degrees! The RIBA award winning new Southbank University in London has become an eye-catching centre piece of campus thanks to our internal cladding! We supplied the new Student Centre with aluminium canopies, stairway and stainless steel lift shaft cladding, along with powder coated metallic bulkhead panels and perforated materials. The core materials for the bright and vibrant space, which have a life expectancy of over 50 years, were manufactured in our 6 acre state-of-the-art facility in Hull, East Yorkshire. New specification guides now available! We have developed a range of new specification guides for Rainscreen Cladding: Secret Fix and Through Fix. These are aimed at providing architects and specifiers with all the information they need to make designing buildings easier. Our brand new guides feature detailed drawings of all of our products, alongside product information, and have been so successful that we are happy to announce the production of Perforated and Column Casing spec guides, a Materials and Finishes brochure, a Stockholding brochure and an Architectural Design Book! Watch this space! Eltherington are proud to hand over 200 pounds to the famous "St Paul's Boxing Academy", and many of you will have heard of the London Olympic 2012 Gold medal winner Luke Campbell who trained at this gym and still works closely with it. In 2013 we entered a team of 10 boxers from St Pauls boxing academy into the Jane Tomlinson Hull 10k and they gained a great 2nd place team ranking. From this event the boxers raised money for their gym and local charity the Smile foundation. 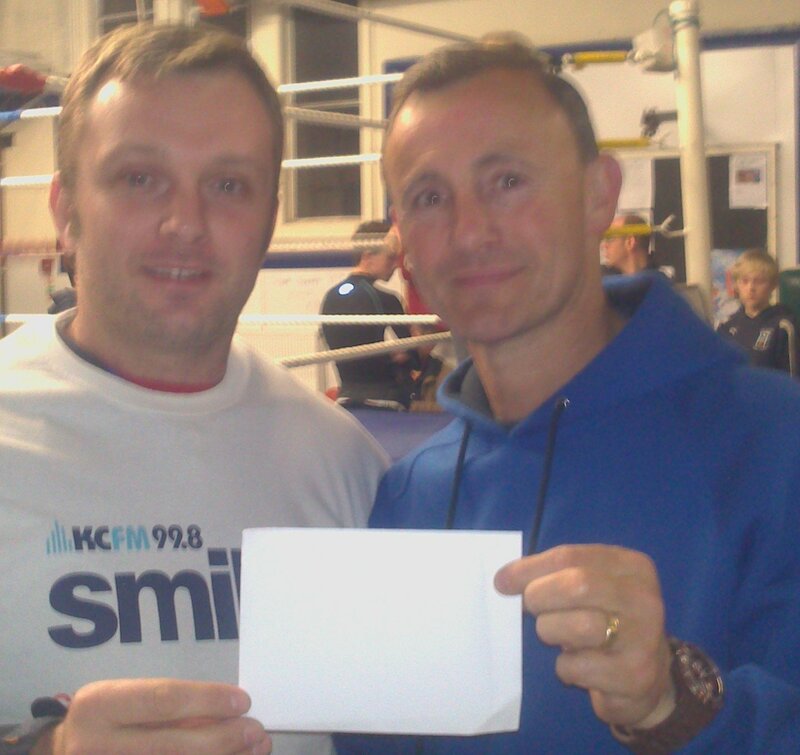 In the photograph Mike Bromby "Head Coach" accepts the cheque from Tony in the Smile foundation T shirt. Mike has been involved with boxing all his life, his commitment to St Paul's boxing Academy is admirable, most days of the week him and his team of coaches give up their time to train around 250 amateur boxers. Many of their school boys enter into the National UK Championships and then go on to be professional boxers. Some of Eltherington's internal cladding has been used at sports facilities around the UK. Eltherington Architectural recently set a competition to all the students of Tresham college, Kettering, to take photographs of one of our architectural products, namely, curved & perforated aluminium lift shaft cladding. 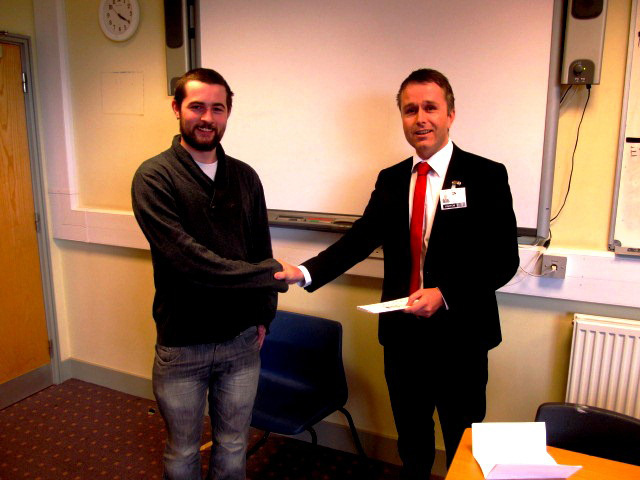 The winner was Robin Alex Ralph who did a great job, we chose him because we could use 8 of his 9 images and we intend to use these in some of our collateral. Michael Riding, Business Development Director at Eltherington, said “The standard was excellent with fantastic close ups from Tyler McRae and some very arty black and white images from Ajay James. We would like to thank all participants for what was a very positive experience, with thanks also to Gary Kennedy & all those concerned at Tresham College for all the hard work in organising the event”. Eltherington Group have supplied perforated cladding to many projects around the UK including London Kings Cross, Belfast, Glasgow and Hull. We are very happy to count Kettering in this line up too. We go on show at world’s leading conference venue. We have supplied a wide range of architectural solutions at Edinburgh International Conference Centre (EICC)! The EICC features our external stainless steel 316 grade column casings, polyester powder coated fascia and soffits, along with internal aluminium column casings and cladding. Our products were chosen as they are low maintenance and create a high level of aesthetic appeal, retaining the contemporary design of the space. We worked closely with all parties throughout to ensure that our products integrated seamlessly with other building elements, and we had to adhere to a strict call-off schedule due to the site being in a busy city centre location, remaining fully operational throughout. Michael Riding, Director at Eltherington, said: “We were delighted to be specified for the new extension to The EICC. Our wide range of facade solutions and many years’ of experience in the architectural sector meant that we were able to work closely with all parties involved to meet the strict schedule”. It was a new year - new website for us! Earlier this year we launched an all-new website echoing our core brand values of innovation, performance and vision. The website is easier to navigate and features more project case studies than ever before! All three of our businesses are now accessible on the Group home page, and you are able to view detailed product information within one click! Our new website features a regularly updated ‘latest news’ section, with links to all of our social media channels and a dedicated area for customers to see our commitment to sustainability and to ‘giving something back’. Antony Eltherington, Group Managing Director, said: “We have given the Eltherington website a complete overhaul to make the site much more accessible and user-friendly. Each sector of our business now has its own direct link on our home page making it much easier for our customers to navigate”.